Just when we thought we had seen it all in our experiences in real estate, we came across something new. A client put a new roof on his vacant house on Walnut Ave. in Walnut Creek. 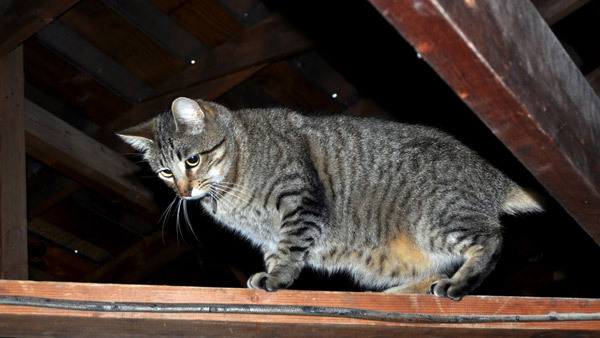 In the course of tearing off the existing material, “Oliver”, the curious cat belonging to the neighboring Zuppan family, climbed up into the attic area of the home. He apparently got “roofed-in” by the workmen. Six or seven days passed with the Zuppans desperately looking for “Oliver.” The weather was extremely hot so it must have been 120 degrees or above in the attic. Neighbor Andy Huang thought he heard a cat meowing and called the Zuppans. Late one evening Pete got a call from Ben Zuppan who asked if he would open up the home and check for his lost cat. Pete raced over with a flashlight in hand and opened up the attic. A frightened and dehydrated “Oliver” reluctantly staggered in the waiting arms of his owner. How he survived for six or seven days in those conditions is anybody’s guess. Ben Zuppan reports that “Oliver” is doing fine but is still just as adventurous as ever. Has he used up all of his nine lives? Very frequently we advise a client not to buy or sell real estate if it is not in his or her best interest at the time. We may advise them instead to rent, remodel, re-roof, or refinance. Some people may not think that this makes good business sense but we call it quality service. Our customers know we were here for them yesterday, we are here for them today, and we will be here for them tomorrow.